2. 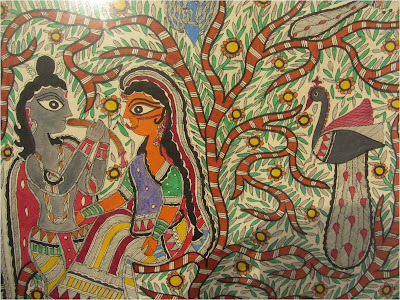 Painting No 1 - "Radha-Krishna". 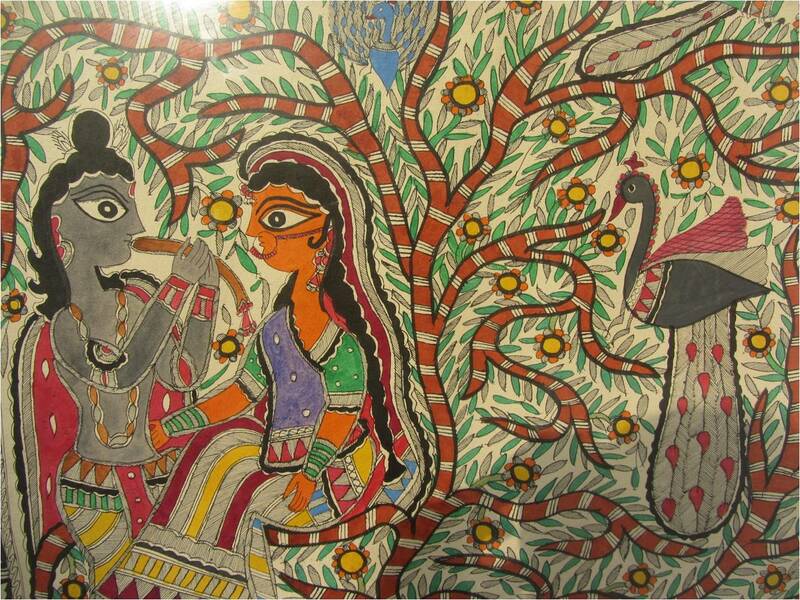 This is the Radha-Krishna painting that I chose because of its rich line work and I liked that the colors were a little dark, many greys, browns and oranges. I loved the small animals you can see in the tree. 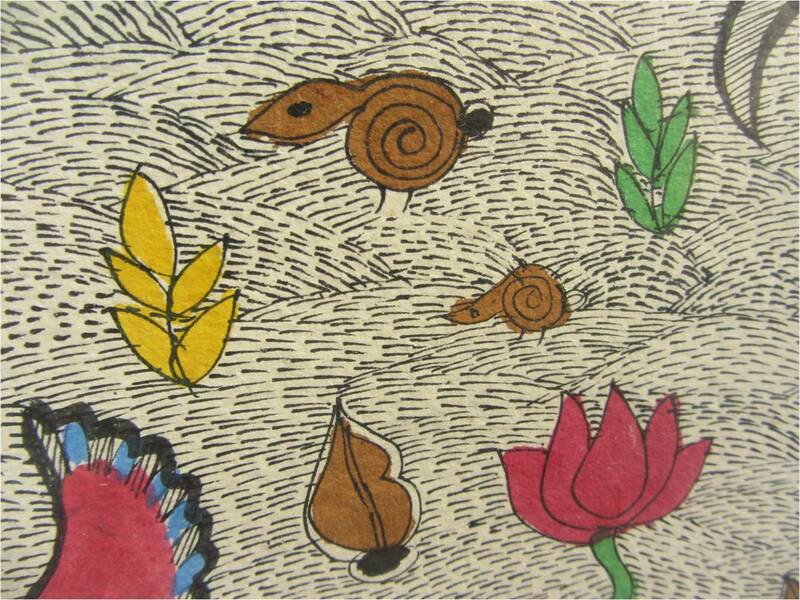 It was a very warm painting which I loved from the first sight. It's the black and white border of the painting above and it doesn't look like the easiest one to draw. It gave a really nice look to the colorful painting. Black and white is so sophisticated. The frame is the antique brown average width and it's the sort of frame that is used mostly to frame Madhubani paintings. 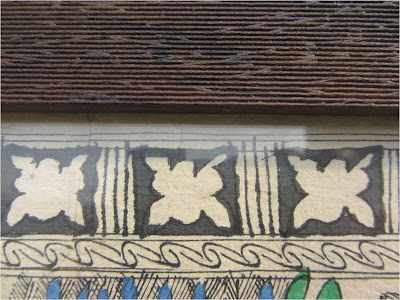 The black antique frame is also often used. 4. Radha and Krishna close up. 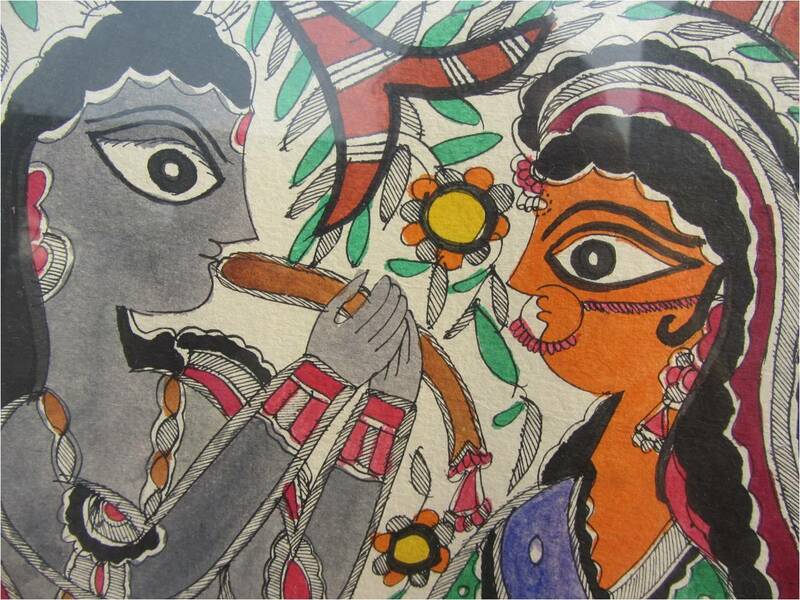 This is Radha and Krishna close up. Both paintings are framed with glass, so the camera reflection in the glass makes it difficult for us to see the details. It's a nice composition of Radha and Krishna being placed on the left side of the painting rather than in the center. That makes it more interesting and involving. Below you can see the illustrated reasons of why I love this painting. 5. The Fishes in the pond close up. 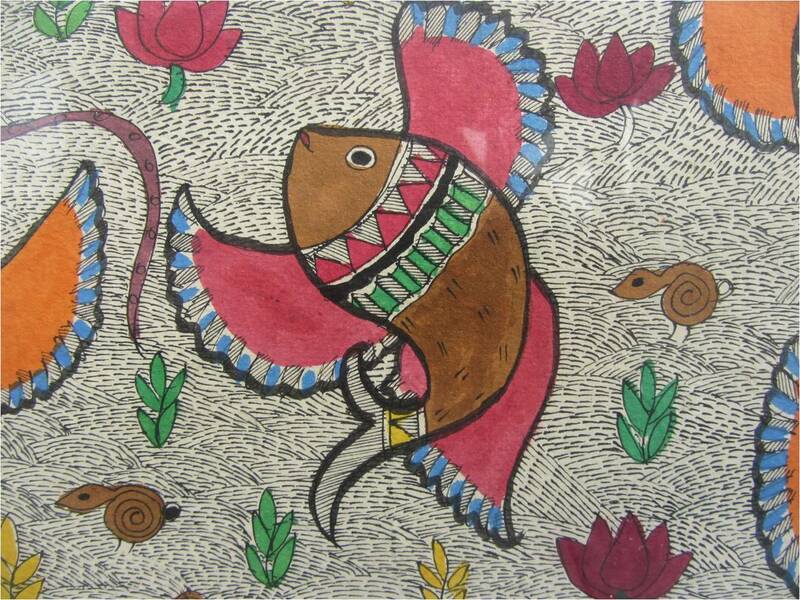 I love fish and when I was buying a Madhubani painting, I asked to show the ones that had fish in them and also I asked for many details. These are beautiful fish and I just love that purple pond border! It's the only purple thing in the whole painting and makes a beautiful contrast! 6. Radha and Krishna faces. 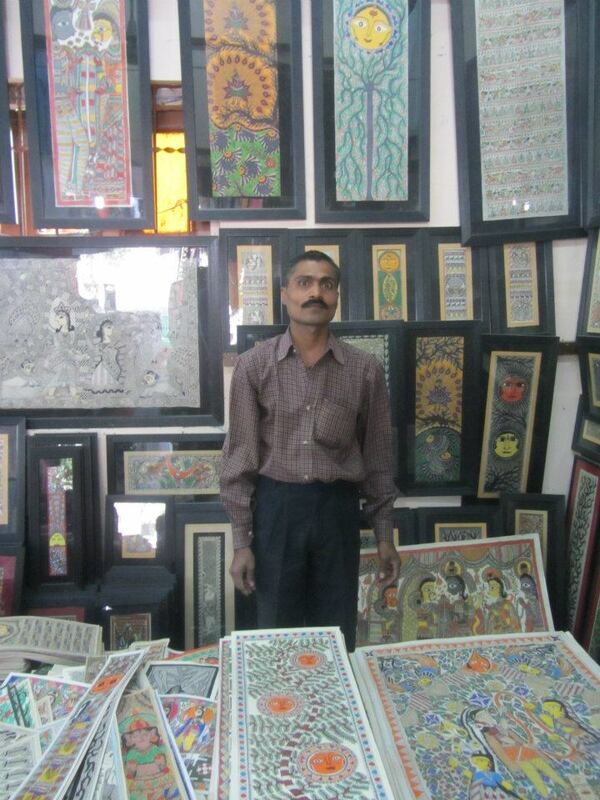 The most difficult thing in Madhubani might be drawing faces. They are primitive but attractive. In other paintings faces are less refined although that is in not a bad thing! 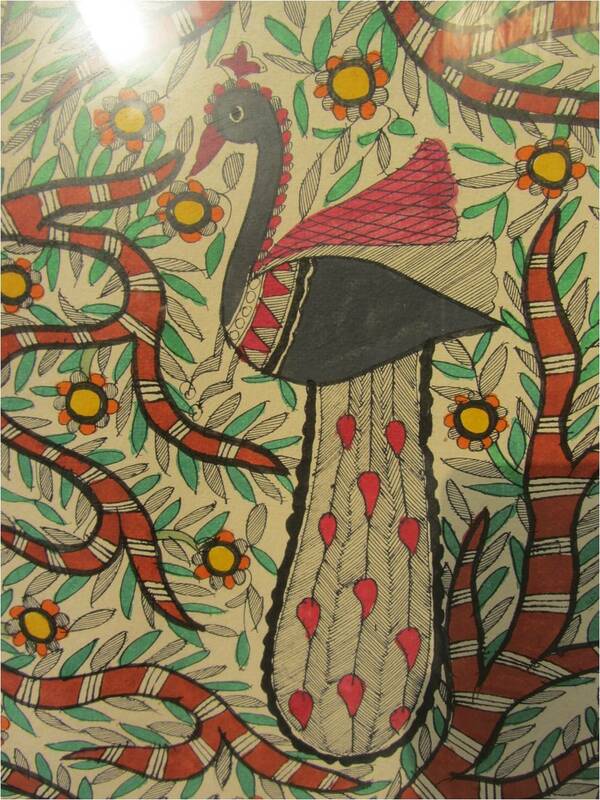 If you ever wondered how to draw a Madhubani peacock design, here is one of them. A lovely blue baby peacock hiding behind the tree branches. Below you can see a little brown deer. 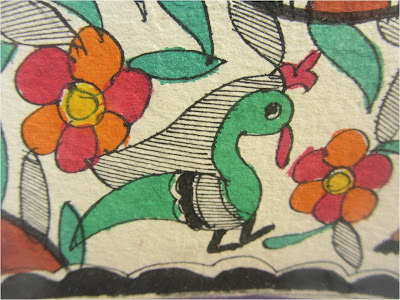 It is extremely cute because it's of the same size as the green bird on its side. There is one small green bird with a beautiful crown and nice beak and eyes. It would be really easy to learn to draw this bird. This is one of the fish that are swimming in the pond of this Madhubani painting. The waves are created using creative line work. 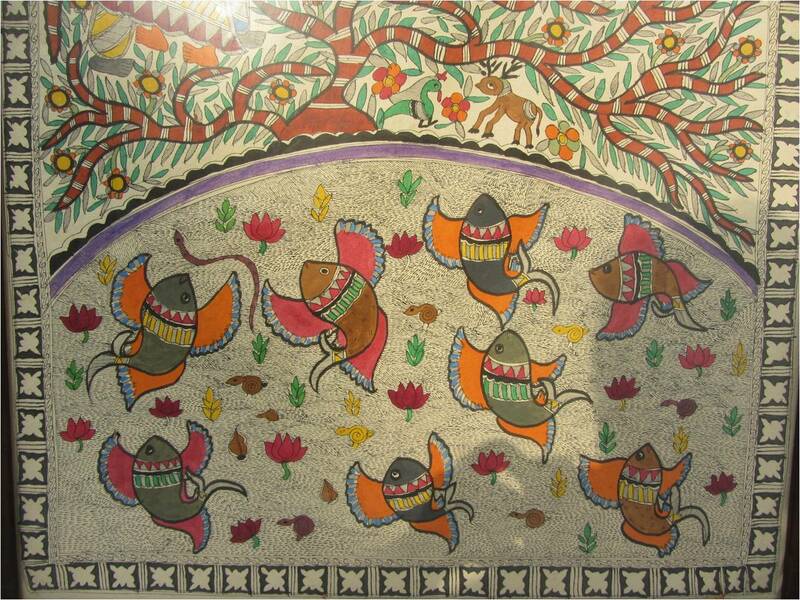 Fish play an important role in Madhubani symbolism and they are the signs of fertility. I love fish because they are related to water which stands for another world, a flowing world, the world without oxygen and could be compared to cosmos. 11. The snails (or snakes). 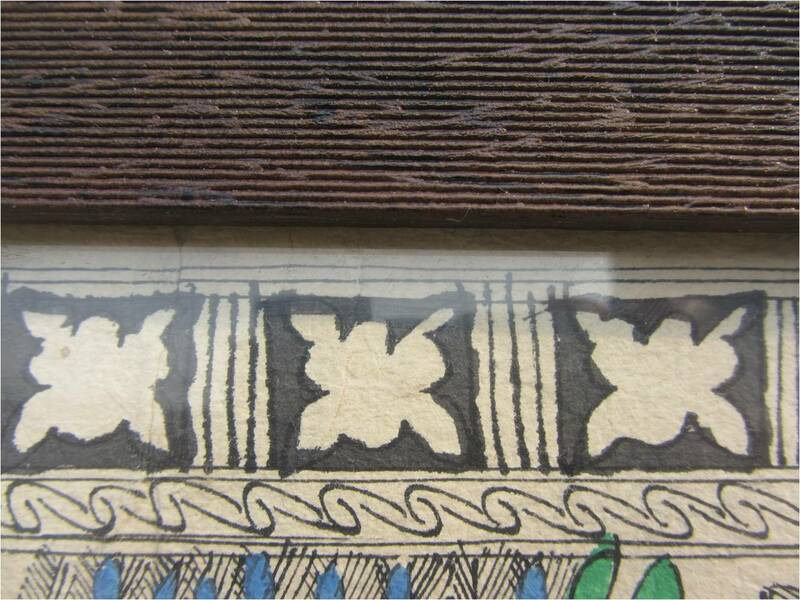 The other lovely painting fragment are these little brown creatures swimming in the water. At first they reminded me of snakes but after looking for a while, they started to look like snails. It's possible that it's neither snakes nor snails. I love how Madhubani is full of the unexpected! There are two peacocks in this painting. 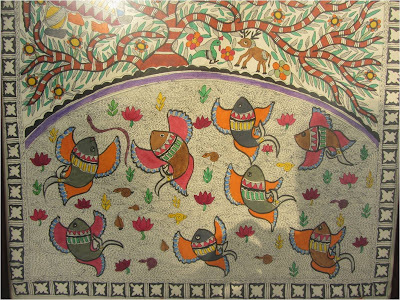 This one is the third largest object of the painting after the Radha-Krishna couple and the fish in the pond. This is a good example of how to draw a peacock in Madhubani style. 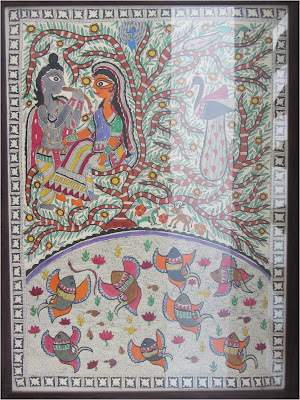 This was my review of one of the paintings that I have - a "Radha-Krishna" painting by the Madhubani artist who's name surname is Jha from Darbhanga, Bihar. 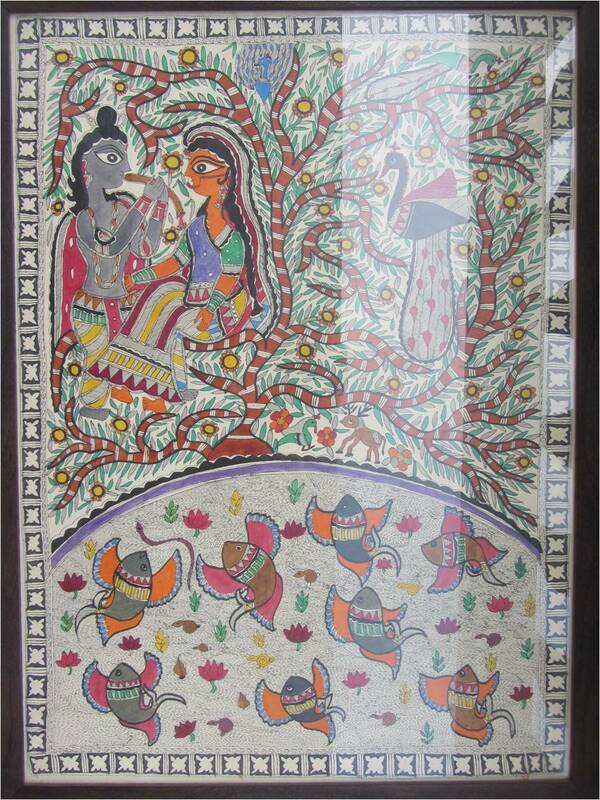 To see the review of the other Radha-Krishna painting that I bought, please CLICK HERE. I do agree, most difficult part in Madhubani would be to draw faces. At least for me. I have seen many painting done by others where the face looks angry more than pleasant. Hello Vasudha, thanks for the comment! 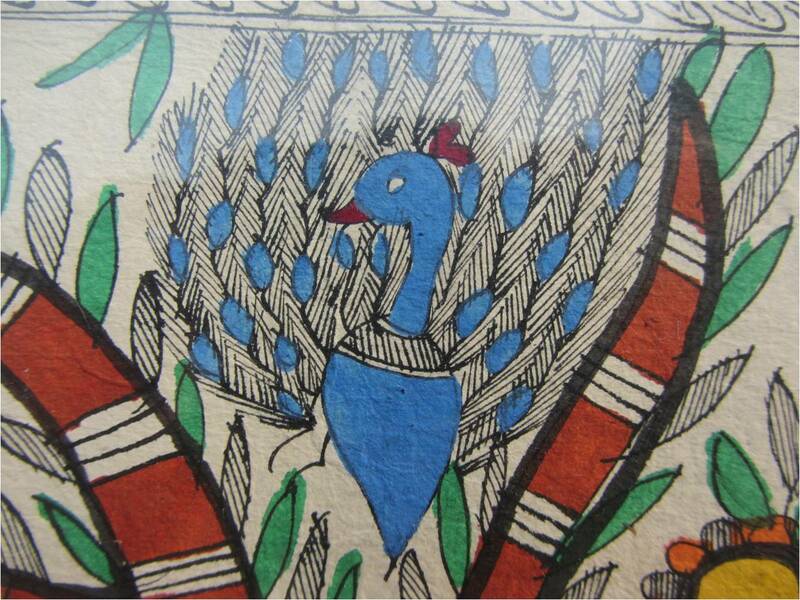 Yes, I agree that some Madhubani faces look rather primitive or even unpleasant. Some look more refined and pretty. I think it's because not everyone can make a nice face. It's really the most difficult part in the drawing. 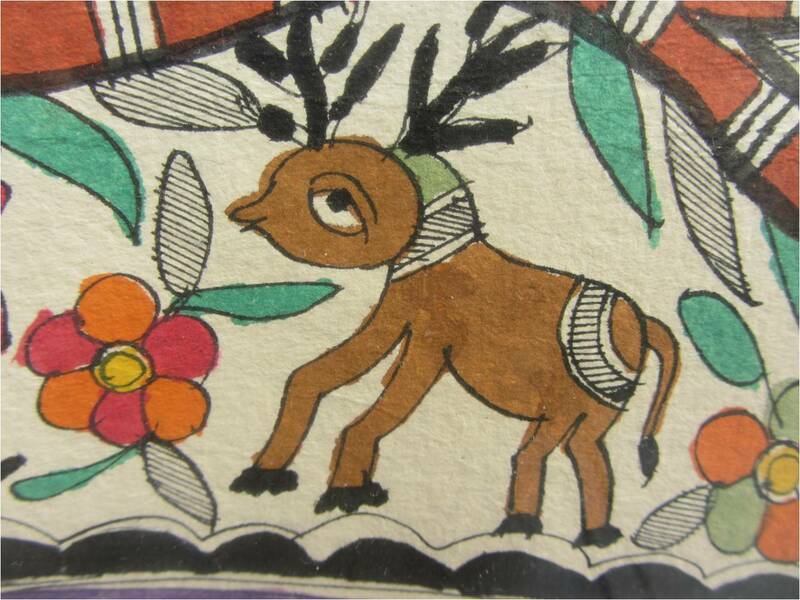 But I love deformed Madhubani faces because they look as if children drew them.